Proteins are long-chain molecules built from small units known as amino acids. They are joined together with peptide bonds. They are biochemical compounds consisting of one or more polypeptides folded into a round or fibrous shape. A polypeptide is a single linear polymer chain of amino acids. The sequence of amino acids in a polypeptide comes from the DNA sequence of a gene. The genetic code specifies 20 standard amino acids. Shortly after synthesis, some amino acids are chemically modified. This alters the folding, stability, activity, and function of the protein. Sometimes proteins have non-peptide groups attached, as cofactors. Many proteins are enzymes that catalyze biochemical reactions and are vital to metabolism. Other proteins have structural or mechanical functions, such as in muscle and in cells. The cytoskeleton is a system of scaffolding that keeps cell shape. Other proteins are important in cell signalling, immune responses, and cell division. Proteins do different things depending on their shape. They can be found in meat or muscle. They are used for growth and repair, as well as for strengthening the bones. They help to make tissue and cells. They are in animals, plants, fungi, bacteria, and also in the human body. Muscles contain a lot of protein. When protein is digested, it is broken down into amino acids. These amino acids can then be used to build new protein. Proteins form an important part in foods like milk, eggs, meat, fish, beans, and nuts and pulses. There are four things that determine what a protein will do. The first is the order of the amino acids. There are 20 different types of amino acids. The second is the little twists in the chain. The third is how the entire thing is folded up. The fourth is whether it is made up of different sub-units. Haemoglobin molecules, for example, are made of four sub-units. Most proteins are enzymes, and mutations may slow them or stop them working. 50% of human cancers are caused by mutations in the tumour suppressor p53. p53 is a protein which regulates cell division. Proteins are necessary in an animal's diets, since animals cannot make all the amino acids they need (they can make most of them). They must get certain amino acids from food. These are called the essential amino acids. Through digestion, animals break down ingested protein into free amino acids. The amino acids are then used in metabolism to make the enzymes and structures the body needs. There are nine essential amino acids for humans, which are obtained from food. Meat contains all the essential amino acids humans need; most plants do not. However, eating a mixture of plants, such as both wheat and peanut butter, or rice and beans, provides all the essential amino acids needed. Soy products like tofu provide all the essential amino acids—as does quinoa—but these are not the only way to get the protein humans need. The scientist Jöns Jacob Berzelius gave proteins their name, but many other scientists have studied proteins. 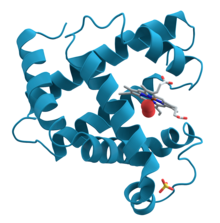 ↑ See protein structure for more on this topic. ↑ see Translation (genetics) and RNA splicing for a fuller account. ↑ Sidransky D. and Hollstein M. 1996. Annual Review of Medicine 47, p285. ↑ Hartley, Harold (1951). "Origin of the word 'protein'". Nature 168 (244). http://www.nature.com/nature/journal/v168/n4267/abs/168244a0.html. This page was last changed on 20 December 2018, at 12:59.